It’s important to note that if you want this recipe to be entirely gluten-free, then you should use gluten-free oats. I purchase mine from Whole Foods. 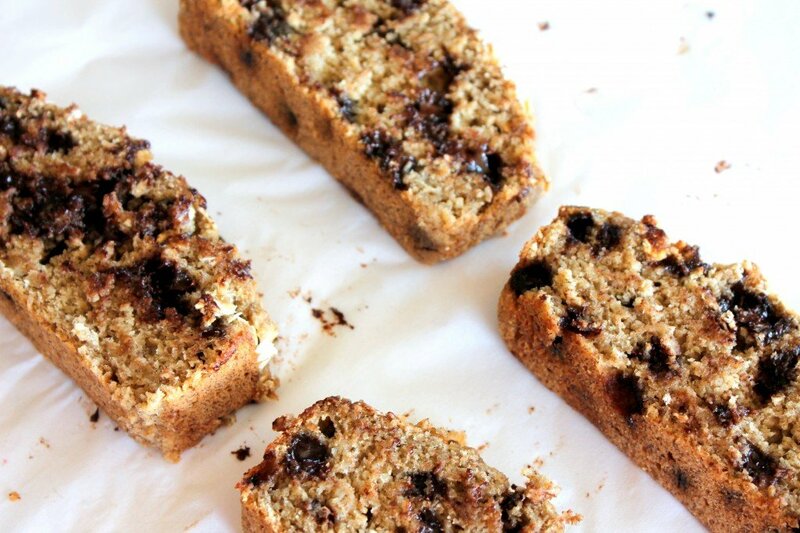 Besides providing delicious flavor, this banana bread is also the perfect choice for a snack. I used minimal sugar: only 1/3 cup for the entire loaf and a smudge of oil to provide some healthy fat. 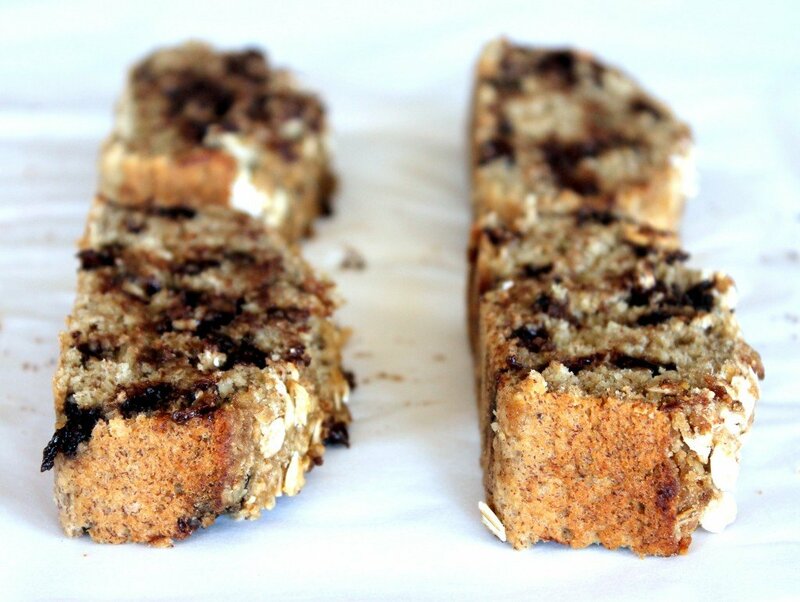 The oat flour is the real star here; it keeps the banana bread moist, chewy and dense. 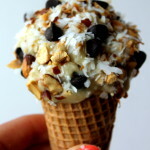 Even if you aren’t vegan or gluten intolerant, you absolutely still have to make this recipe. A little slice of love staring you in the face. I think I forgot to tell you that I can predict the future; that means I know you will make it and LOVE IT. I’m full of surprises. 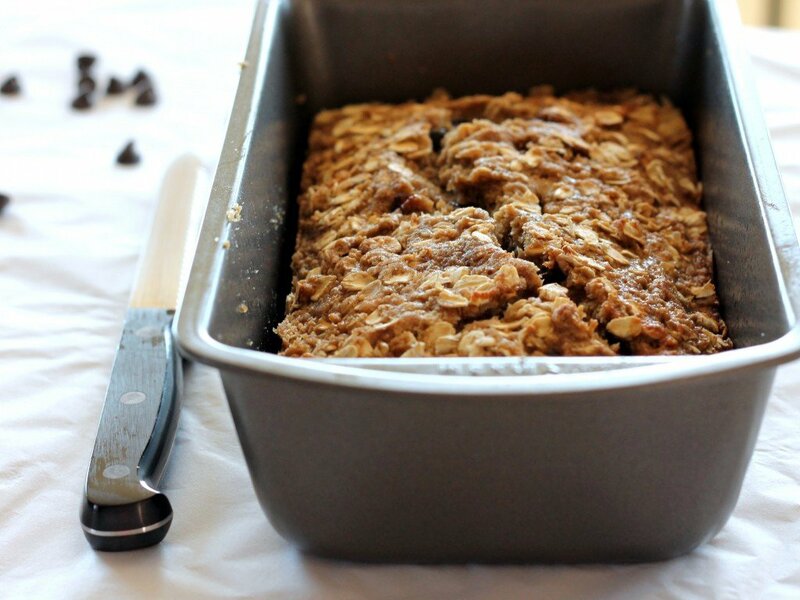 Using gluten-free oats, this banana bread stays moist without excessive added fat from oils. Slightly sweet, perfectly moist; it will surprise you with flavor! Gently fold in chocolate chips. Pour batter into prepared loaf pan and sprinkle 3 tablespoons oatmeal and 1 tablespoon brown sugar on top. Bake for 35-40 minutes or until knife inserted into center comes out clean. Cool 10-15 minutes, then remove from pan and place on wire rack to finish cooling. Cut into thick slices. Bread will stay good for up to 3 days if wrapped well. Feel free to use less chocolate chips. Adding chopped walnuts or coconut flakes to the batter would provide additional delicious healthy fats. 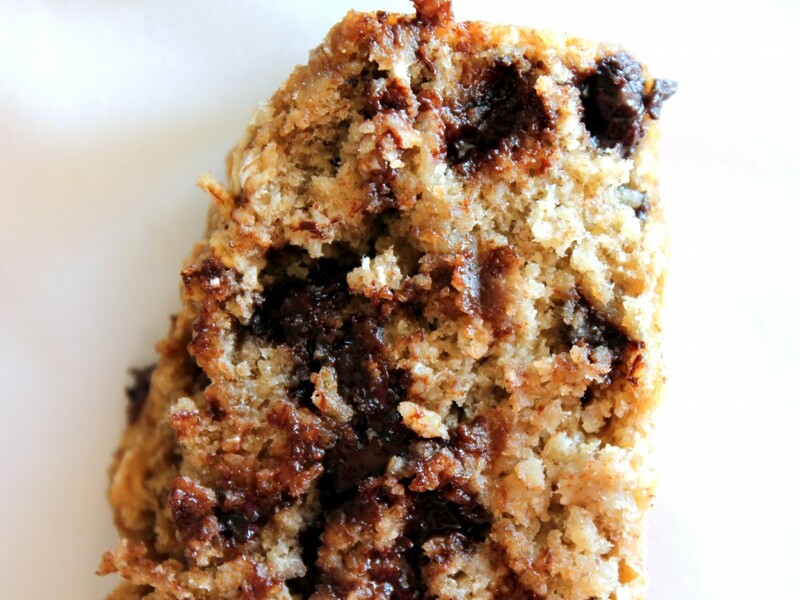 103 Responses to "Vegan + Gluten-Free Chocolate Chip Oatmeal Banana Bread"
I can’t wait to make this,it sounds wonderful!What would happen if I just left the oatmeal as it was and didn’t put it in a blender? Hi Julie, I don’t think the recipe would work the same. 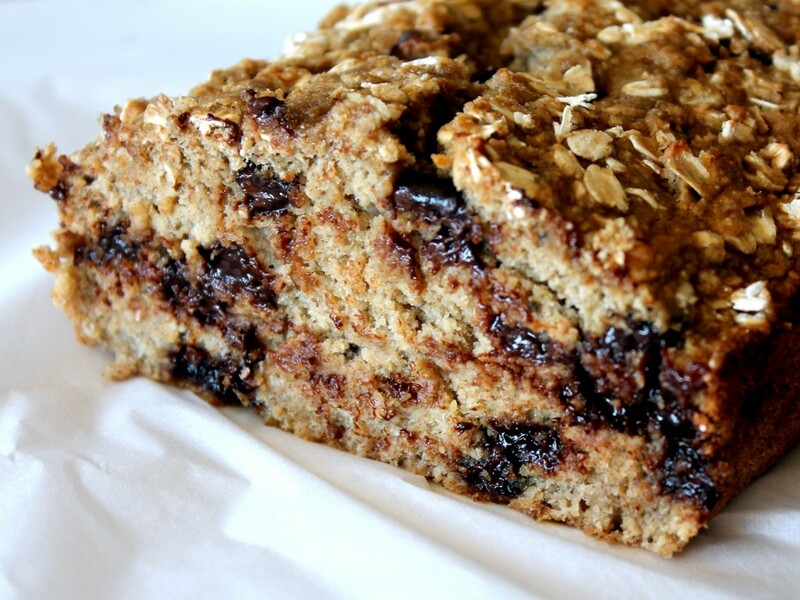 But you could try it in an 8×8 inch pan; essentially it would just be baked oatmeal squares. Let me know if you try it. Looks very dense and heavy without much rise. Don't think I would try this one. You missed out if you didn’t. It’s absolutely fantastic. I have had dozens of people ask me for the recipe over the past few years that I’ve been making it. Wow. Those melt-y chocolate chips are calling to me! This looks delicious! I have 15 bananas that I will be needing to make something with soon and then I was thinking how I haven’t found a GF, vegan banana bread recipe (or one that looks appetizing), but thanks to you I now have one. I will be trying this once the bananas ripen. I can also bet I`ll LOVE this too! 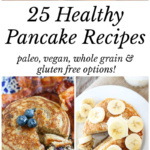 Added bonus that they`re gluten free and vegan! i’ve made this bread twice in the last three days because my boyfriend loves it so much! the second time i swirled peanut butter in the top because he’s a pb fanatic:) thanks for the great recipe! btw, this is possibly the best banana bread i've ever made. And not nearly as "skinny" as the picture makes it look. I have a huge, hearty loaf and a hubby who wants to eat it!!! I had oat flour on hand so I didn't make it from scratch, but it looks really easy. That may be the only ingredient you have to plan ahead/around for. Yum! Definitely on the list. Yummy! I made mine into muffins and reduced baking time to 16 minutes! Thanks for the great recipe! So good and came out exactly like your pictures! I was wondering if you have the nutritional value per serving. Thanks! Sorry Scarlett, I don’t at this time. But in the future I plan on posting nutritional value for my healthy baked goods. Thanks and I’m looking forward to it! This bread is wonderful moist . It will be ashamed to skip it. I made it for a vegan friend and one for my family . It was delicious . Great job. I am making more to give them as gifts. Thank you very much. This is defently something to be thankful for. just made mine and it is in the ovennnn! I made half with chocolate and the other just plain because my sis cant have chocolate and she likes it with jam I'm excited! just waiting! Sounds and looks divine. I'm making it for a Christmas treat! So great! Made this today and will definitely make it again! This came out wonderful! I added blueberries and pecans instead of chocolate chips. Thanks for posting, I’m defiantly making this again. I think I'm going to try to make this with leftover baby food. I’m eating this bread as I type. OMG, so delicious! Monique, your recipes are so fabulous. Please, do not, EVER, stop posting recipes. Everyone needs to make this banana bread. This is now my go-to banana bread recipe. Thank you! Great flavors! Bread stays moist, and toasted with butter, yummy. Very tasty and moist! I added raspberries, and substituted honey for the brown sugar. 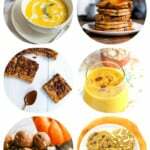 Thank you for a wonderful and healthy recipe to enjoy! Thank you so much for this recipe! It’s very moist and not too sweet. Not dense at all. Just amazing. I substituted the brown sugar for 1/4 cup buckwheat honey, omitted the salt, used small chunks of unsweetened 100% cacao baking chocolate, and sprinkled with hemp hearts. I made them into muffins and reduced the cooking time to 27 minutes. 🙂 Next time, I’ll add some ground flaxseed for extra nutrition. I iust made it and it was fantastic. 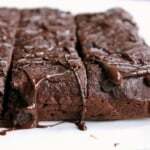 I used blueberries instead of chocolate and added ground flax seeds. this was delicious and simple. I did not put chocolate chips in, but still delicious. If I wanted to sub the bananas for canned pumpkin should I also add applesauce as a binder or no? I used chopped walnuts and pecans in place of the chocolate chips and this recipe is really good! Thanks for sharing. Holy moose…this is AMAZING!!!! I love how simple it was to throw together too. I skipped the choc chips & wow…you rock!!! I have enjoyed this bread many times – thanks for the great recipe. I just wanted to say when I ran out of bananas this week, I chopped up 4 small apples, boiled them into chunky applesauce, and used them instead, along with a handful of ground flaxseeds to absorb the extra liquid. I thought chocolate chips would melt with the hot apples (not such a terrible problem…) but I threw in frozen raspberries instead. It was a delicious variation. what do I do with the remaining cup of oat flour? Hi! I used almond flour and coconut flour in place of the oats. I also used dates and stevia in place of the sugar. I added 2 egg whites to make sure it fluffed up…it was too dense, like a rock. I am assuming it’s the flours…what do you think? 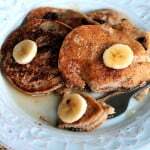 Hi Julie – Using different flours, eggs and stevia completely changes the recipe. Different flour require different liquids and fats – as they all absorb differently. I recommend finding a recipe that using those flours! Will store-bought oat flour work? I dont own a blender. 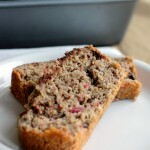 This is my absolute favorite healthy banana bread recipe. I always sub out the brown sugar for applesauce and it turns out fabulous. How do you sub out the brown sugar for applesauce? Do you use a 1:1 substitution? I have been thinking of how I should eliminate the brown sugar, so any advice is appreciated. Thank you! I Just want to tell you….this bread is AMAZING! I love muffins and donuts and such with my coffee, and when trying to be healthy and gluten free, I rarely find treats that fit my cravings. This one certainly did the trick and I absolutely love it! Next time I’m going to try it with blueberries to be extra healthy. Thank you so much! Isn't it to less wet ingredients in recipe? I just made these into muffins… SO delicious and moist! Amazing! Is the cooking time different if I use a glass loaf pan instead of a dark metal loaf pan? I am gf, and this is by far the best banana bread I’ve ever tasted–wheat AND gf! I used only 2 cups of the oat flour to make them less dense and added an egg because I am not vegan. They turned out delicious!! Only next time I will add another tablespoon of avocado oil because they did not come off clean on the paper cups I used. Is the coconut oil room temperature or melted? Can I substitute whole wheat flour for the oat flour? Hello! This recipe sounds divine! Can you tell me how I might sub raw honey for the brown sugar? Would it be 1:1? YAY finally made this last night, and it was PERFECT this morning with my cup of coffee. Perfect amount of sweetness, and so moist. Love how simply healthy it is. Thanks, girl! My toddler and I made these today. Added some raisins too. Very delicious. I have to hold back from eating it all at once haha. Thanks for an easy and fun recipe! Love the recipe! Made them as muffins and they are great. Just wondering; the ingredients lists 3 cups oats but then the instructions lists 2. Which is accurate? 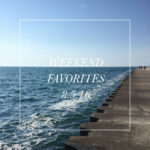 Thanks for your amazing recipes! Favourite baking website. I didn’t use the chocolate chips and ended up using slightly less than 3 cups of ground oats with an extra half tsp of baking powder and an extra 1/8 tsp baking soda. I also added some cinnamon to the batter as well as the top crumble. It was a huge hit with the teenage boys who at first were reluctant to give it a try but then devoured it. Thank you for posting this recipe! I tried a non vegan, non gluten free highly recommended recipe for banana bread and it wasn’t nearly as good as this. This really makes the best banana bread ever. The boy-mob is obsessed with it! You really nailed it. Now I’m looking to see what else you’ve got! This is my go to recipe for banana bread! perfect for breakfast or a quick snack and so hearty and guilt-free! I have made this recipe 20-30 times. It is always a huge hit. Made it as muffins today, and they were a bit dry. I baked it around 30 minutes, might try 25 minutes next time. Anyway, thanks for this recipe Monique, it’s amazing! Hello in 2019! We are family chock full of food allergies and this bread is amazing!! Fluffy but hearty and not too sweet. Thanks! Holy Moly this is a 5 star ⭐️ ⭐️⭐️⭐️⭐️ Winner!!! I didn’t have much faith going in as there was no egg substitute, so little oil etc. But this recipe is simple perfection!! !